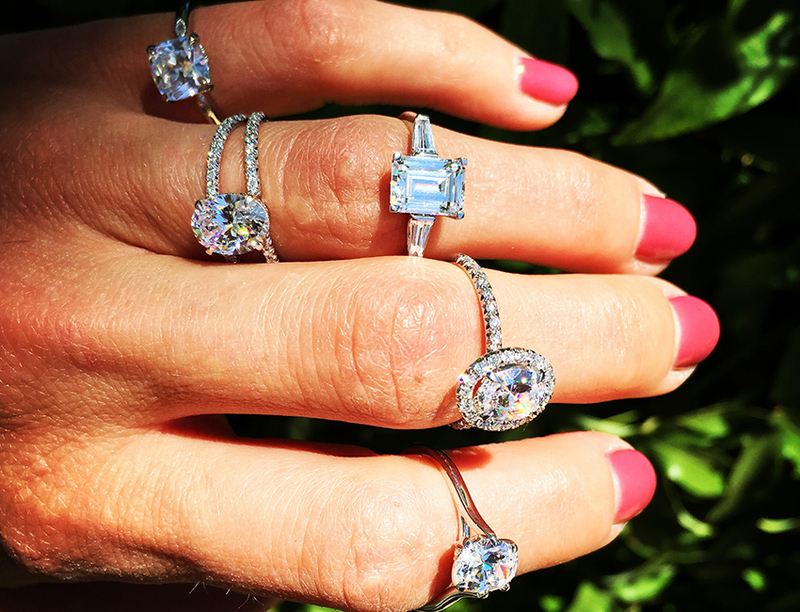 Engagement rings are traditionally worn on the left ring finger. We go through life avoiding wearing anything on this finger, therefore many women don’t know their ring size. The good news is that most women know their right ring finger size and although this won’t tell you the left it will at least give you a frame of reference. If their right-hand is their dominant hand (and most people are right-handed), it will tend to be a ½ size bigger than the left. If she has a ring that she wears on her right ring finger you can have the ring sized by a jeweler. Avoid using print outs of ring sizers online. They don’t work. The average woman wears a size 6-6.5 ring at a 2-3 millimeter width. As you shop around, you will see most women’s rings in the display tend to be this size. A ring size smaller or larger is not uncommon. The most important thing is to get as close as possible and always go on the larger size if you are nervous it won’t fit as sizing a ring down is much easier. The difference between a 6-6.5 is so tiny that she might go back and forth between the two sizes. For example, if it is a hot day, hands will swell making her ring size go from a 6 to a 6.5. Because of this, it is always wise to size up and be willing to make adjustments later. While she isn’t looking, take a photo of her hand. We are experts and can give you an almost exact measurement based on a picture. Ask a best friend. 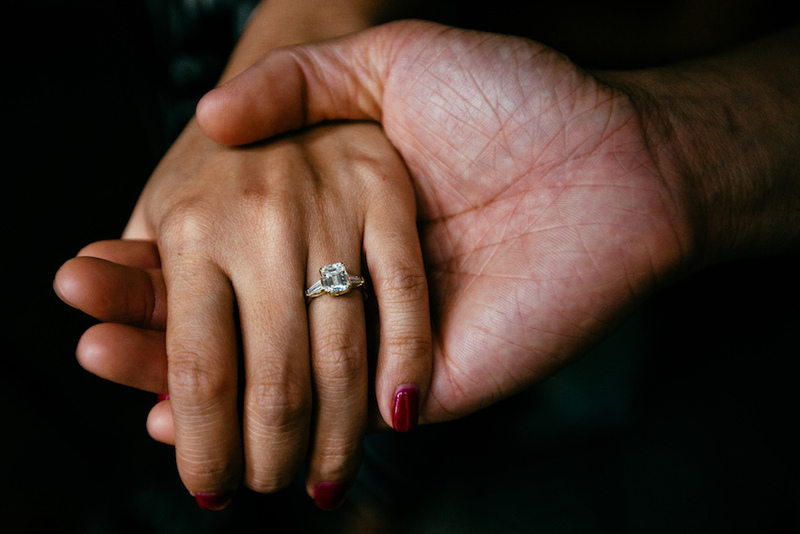 If she’s been somewhat expecting a proposal, she most likely has spilled to her friends all about her dream ring and what would look best on her ring finger, as well as her ring size. If you don’t have the exact measurement and nothing we’ve suggested has made you feel confident, choose a ring that she can resize. Bands that have metal on the bottom of the ring will allow for sizing. Don’t choose eternity style (diamonds all the way around) as it’s much harder and often impossible to size these. Best case scenario is to get her professionally sized. If you’re walking around and come across a jeweler, go in. Casually mention that you may need her ring size one day. Most likely, she won’t be afraid, but excited that you are thinking ahead. Not to mention, this will save you from all the of steps above down the line! Using a ring she wears on another finger as a guide. You will most likely be using a smaller or larger ring which will lead to inaccurate sizing. Don’t use a ring size guide that you’ve printed out online. They are not accurate. Similar to the paper test, wrapping a string around her finger in her sleep will yield inaccurate results. It just doesn’t work. Not only do you need to determine what size you are getting, but you also need to consider the width. If the ring is wider than 4 millimeters, go up a ½ size for every millimeter after. Don’t forget this rule when stacking an engagement ring with wedding band(s) as these will increase the width of the ring. We want her to be comfortable! What is resizing? As mentioned above, eternity bands (bands with diamonds all the way around) usually cannot be resized. In the resizing process, bands made of metal will be heated up, split at the back of the band, and added or subtracted with the correct amount of metal to increase or decrease the ring size. Scout Mandolin is happy to help you throughout the ring process. Please feel free to contact us for any additional questions or create the wedding ring of her dreams!